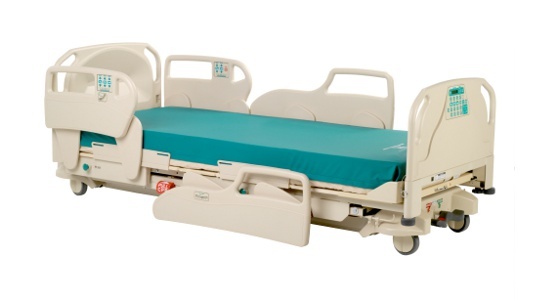 Spirit Select low hospital beds are ideal in healthcare environments such as Rehabilitation and Mental Health care. An ultra low bed height is often essential with these patient populations, to reduce falls from bed, and facilitate bed mobility. Specifically for mental health care, Spirit Select beds are available with a “Mental Health Package” that includes these additional safety features: permanently mounted headboard/footboard, restraint loops along both sides of the mattress deck, tamper-proof actuator cover, mattress deck permanently bolted to bed frame, removable short power cord, and tamper-proof fasteners used throughout the bed. CHG is excited to announce the innovative new side rail for Maternity Ward beds. Specifically designed with the safety of mothers and babies in mind, the CHG Maternity feature allows hospital patients to control the positioning of the bed to a greater extent, ensuring the safety of their baby. The Maternity rail allows patients to control the height of the bed, as well as the position of the rails from the inside control panel located on the interior of the upper siderail. Having the ability to lower the rails easily with the touch of a button gives new mothers the independence and security they desire when transferring their babies between the bed and the bassinet before and after feedings. CHG’s goal is to create a safe hospital environment not just for patients, but staff as well. Sprit Select’s Antibacterial Rails and Head/Footboard, Open Architecture, easy-to-clean bed frame, and infinitely adjustable positions help caregivers tend to their patients’ needs without risking their own safety. Spirit Select is the ideal hospital bed for pediatric patients. Traditional hospital beds can be very high, even at their lowest height, and a high and unfamiliar hospital bed can create an uncomfortable sleeping environment for children, causing restlessness and sleeplessness, which can lead to falls. Spirit Select is the only hospital bed that has an ultra low height of 10-inches from the floor. To help ease the transition between home and hospital environments, Spirit Select’s low bed height helps children to feel more secure so they can sleep comfortably. Children also need a lower bed height to help facilitate safer bed transfers. Spirit Select’s low height helps children to enter and exit bed properly and safely. Spirit Select beds are used widely throughout the VA healthcare system. Patient Falls and Safe Patient Handling are two important VA safety initiatives, and the Spirit Select has helped many VA hospitals achieve their safety goals. With a low height of just 10-inches, Spirit Select can reduce patient falls and injuries. This low height also makes it easier for patients to enter and exit bed, reducing falls during transfers, and minimizing staff transfer assistance. Best of all, Spirit Select is the only low hospital bed with an integrated scale, which reduces the need to transfer patients for weighing.